Last month my dear friend committed suicide, and in the middle of many emotions I came into contact with that part of the Internet that specializes in the business of dying. 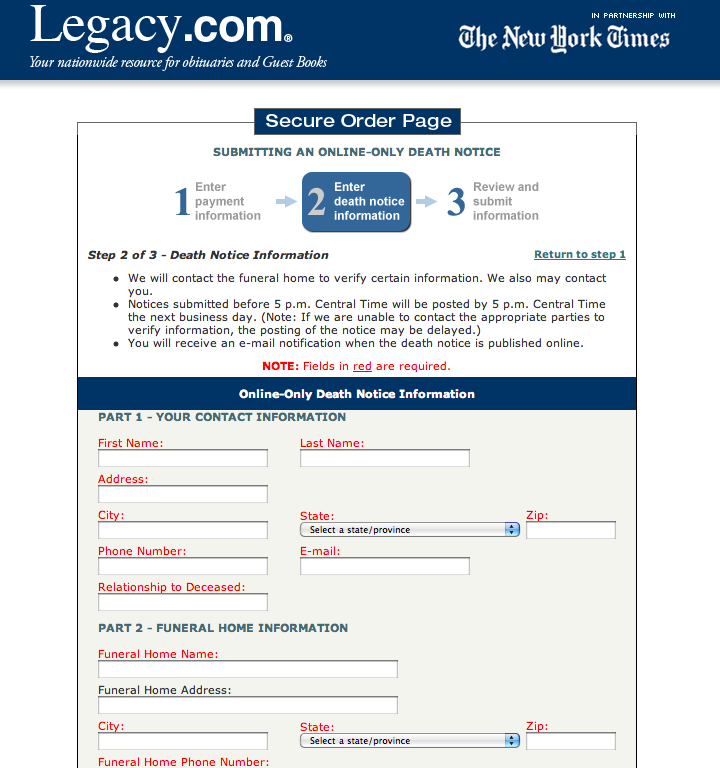 My friend's parents had bought an online obituary at the New York Times website, something I later found out was run by an outfit called legacy.com. The obituary includes a guest book, where you can send your condolences. There is a little text generator, in case you're out of ideas; you can "light a candle", and there is also a tie-in to an online florist who very generously offers to say with flowers what you might not be able to express through the text generator at such a difficult time. I was mildly surprised not to find a selection of tasteful, black-rimmed emoticons, a bit of kitsch that would have delighted my friend. I wrote a condolence letter (as I had no other way to contact her parents) and when I submitted it, the site warned me that the "guest book" would expire in a little over a month, but if I liked I could pay to extend its life by one year ($29) or keep up "in perpetuity" ($79), presumably meaning for however long legacy.com stays in business. Since we have for-profit undertakers, it seemed tacky but not unusual that there should be a business in online guest books for dead people. Knowing a bit about the economics of online services, and what kind of a profit margin that $79 represents, it was perhaps a little galling. But legacy.com pays moderators to check death notices and screen posts, so they can certainly argue they're providing some kind of value. Things got decidedly sketchier a few weeks later, when legacy.com decided to email me a reminder that the guest book (which I had only posted to, not created) was about to meet a fate very similar to the person it was honoring if I didn't act promptly to renew, which, legacy.com suggested, would be the perfect way to show my support to a grieving family in a difficult time. When you are mourning someone, any automated reminder about their death from a website that wants your money is going to cause what you might call a negative customer experience. It doesn't matter whether you entitle it "A gentle reminder from legacy.com" or "DEAD FRIEND'S NAME IN ALL CAPS Guest Book" (although guess which one they went with). I decided to see what the other end of this operation looked like. As an experiment, I visited the obituary section of the New York Times website and followed the steps to submit my own online death notice, stopping only at the final confirmation screen. 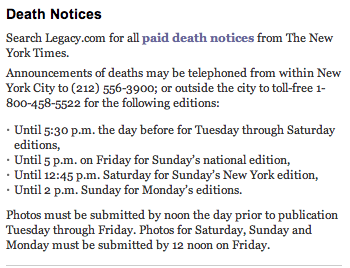 The death notice section of pretty much every major US newspaper is run by legacy.com, "skinned" to look like the rest of that newspaper's site. 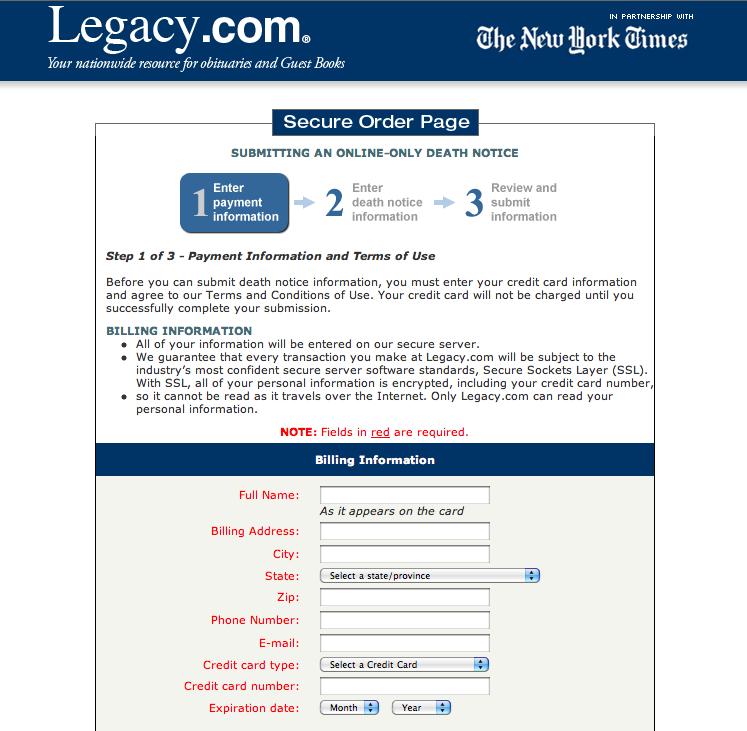 The first step in creating a legacy.com death notice, before anything else, is providing a credit card number. At no point, including the final confirmation screen, does legacy.com tell you how much you will be charged. At no point is there a link that you can follow to find out how much you will be charged. The site requires you to confirm that the transaction you are about to complete is completely non-refundable, even though they never disclose the amount. Screenshots here: one, two, three, four. You can also try this for yourself, use 4111 1111 1111 1111 as a credit card number. In other words, the site takes money from bereaved people without disclosing what it's billing them, gambling on the fact that they're probably too preoccupied to care. Whether or not this kind of thing is legal, it is completely unethical. Even an undertaker who has upsold you on everything from coffin to funeral buffet has to show you a number before you sign on the dotted line. If you Google around long enough, you may find your way to the New York Times rate sheet, where the small print tells you that an online death notice costs "from $79". But you won't find this information from anywhere within the legacy.com payment funnel, nor will you find any more information about that evocative word from. I find it odious and troubling that the New York Times, along with a raft of other major newspapers, partners with this kind of website. It seems like further confirmation that newspapers will now clutch at any revenue stream. I would very much like to see an online competitor put these vultures out of business. I think a respectable and respectful business model would be to charge a small fee for death notices and make comments read-only after some interval unless the creator paid to extend a default moderation period. 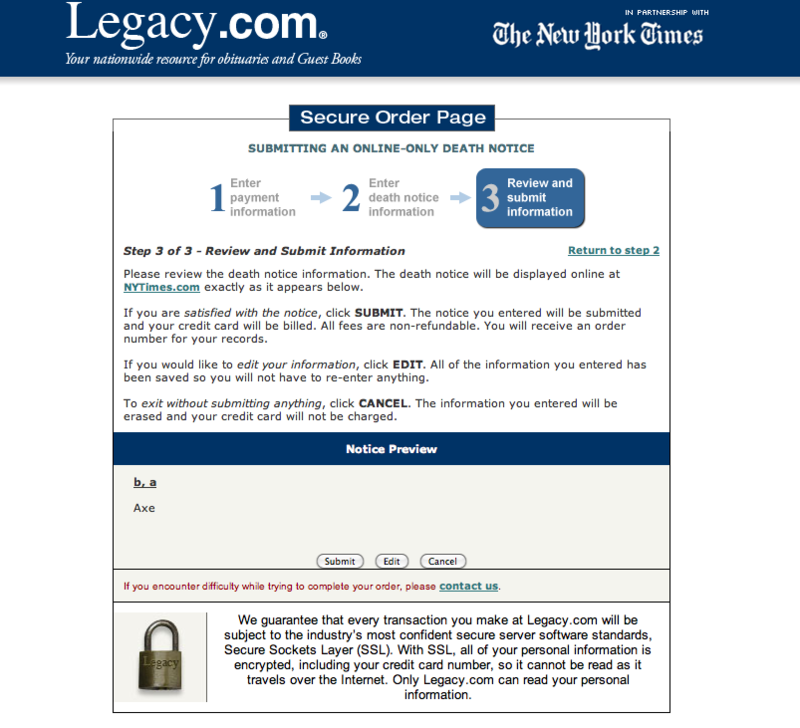 The day after publishing this post, I received an email from the Director of Operations at legacy.com, who tells me the direct link to their order form from the NYT obituary page was a mistake. Legacy.com has changed this link to lead to a page that includes price information.